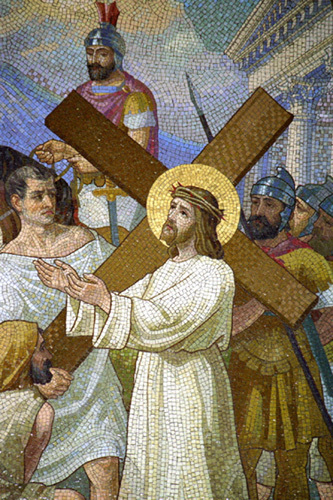 Jesus takes up His cross and starts the journey to Calvary. The cross represents all of our sins. It was not just the sins of those around Him at that time but the sins of us all until judgment day comes. We are all called to pick up our crosses and follow Jesus on this road to salvation. In Matthew 16 : 24 “Then Jesus said to his disciples, “Whoever wishes to come after me must deny himself, take up his cross, and follow me.” Our crosses are personal to each one of us. For some it may be that your cross is health issues, marriage problems, sins, family problems, anger, pain, sorrow, etc.. There are many crosses we carry each day. I also must say that at times it feels like we are carrying more then one of them at a time. Everyone of us carry a cross in this life and sometimes we have no idea what crosses those around us may be carrying. Keep that in mind when you are carrying your cross, that you are not the only one. No matter what we are going through or what crosses we are carrying we need to follow Jesus. It is not an easy thing to do at times but call on Jesus to help you get the strength to carry on. Our faith helps us carry those crosses because we know that Jesus is there to help us and also know the gift of Salvation that was gained from the cross. Each time we continue on with the journey to Calvary we are seeking salvation. We are there on the road with Jesus. Allow your Lenten journey help you gain faith, love and mercy to aid you in carrying those crosses in your life. Seek Jesus on your daily walk. Pray not only for strength but also for those around you who are carrying their crosses as well. Each one of us are called to do this and remember you are never alone on the path. Until tomorrow, God Bless, and remember we all carry crosses in this life.